Heidi practices primarily in the areas of estate planning, trust administration and probate matters. She was born and raised in the Coachella Valley. After graduating from the University of California at Davis she moved back to the Coachella Valley and worked as a substitute teacher for Coachella Valley Unified School District. She then moved to Boston, Massachusetts and received her Juris Doctor from Northeastern University School of Law. 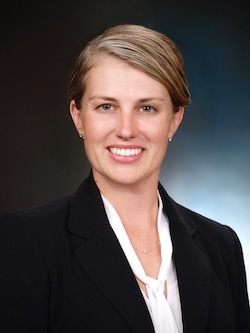 Heidi has been working with Burt & Associates since 2007, first as a legal intern and then as an attorney after passing the California bar in 2009. Heidi is a Certified Specialist in Estate Planning, Trust & Probate law and is admitted to the State and Federal Courts in California. She was named a Top Lawyer by Palm Springs Life in 2017, 2018 and 2019. In December 2018, Heidi was awarded the Martindale Hubbell AV Preeminent Peer Rating which recognizes attorneys with the highest level of professional excellence. Heidi is on the Board of United Celebral Palsy - Inland Empire. She is married and has a daughter. In her spare time she enjoys traveling, cycling and hiking with her dogs, Gaspard and Mavis.